It’s a free PDF eBook that I put together. It contains stories, flash fiction and prose experiments that have been just gathering dust for a few years. I love the DIY feel of zines, so I tried to impart that feeling to the collection. The overarching theme of the collection is my fascination with death. It’s volume 1, because if it goes over well, I might try this again. 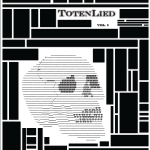 Totenlied Vol.1 is a collection of short fiction from over the past few years. The PDF is free to download. Why a free PDF eBook? I needed a writing sample on my website, and I’ve been kicking the idea around for a couple years. Maybe you’re wondering why I would self-publish it instead of submitting these stories to magazines/reputable short story contests/etc. A few years ago, I didn’t know that I couldn’t submit stories that I’d posted to a personal blog and/or forum like r/nosleep. So a number of these stories have been posted elsewhere. That, or I didn’t feel like they were suitable for submission for one reason or another. I like the idea of it being freely accessible and easily passed from one person to another. I’m publishing it under a creative commons license. Basically, anyone can copy or adapt any part of it so long as they credit the source and don’t use it for commercial reasons. What’s up with the art? I’m not much of an artist, but I have a real soft spot for Ascii art. I also love the idea of letters and punctuation representing images. I used reference photos from around the web and some help from http://www.glassgiant.com/ascii/. I ended up going in and doing significant edits to make it look the way I wanted. I really like the low-fi feel of the Ascii art. I did all the layout design in Word. Or you can check out my writing page to grab a copy. Please let me know what you think.